Over 1 million incorporated companies call Delaware home. Half of the nation’s largest businesses and Fortune 500 corporations benefit from Delaware’s advantageous taxes and legal resources. This state is ranked as one of the nation’s best places to form a company and as one of the most business-friendly environments, thanks to its flexible corporate legal system. A Delaware makes your personal asssets more secure by putting a firm barrier between your business assets and liabilities and your personal property. Delaware corporation are respected around the world. 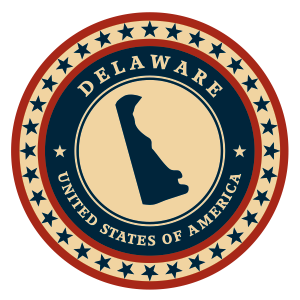 Delaware is known as a reputable jurisdiction, home to many of the best regarded major corporations in the world. Delaware requires that any new C corporation or an LLC use a name that isnot already in use or might be confused with another business carrying a similar sounding name. A unique corporate name enhances your company’s reputation and also helps protect the identity of your brand. To make sure your business name is eligible check out our free corporate name search section. Delaware assesses no tax on corporate income earned outside the state. It does charge a modest franchise tax. Corporations have the ability to calculate their tax using the method most beneficial to them . Corporation taxes are due March 1st of the year following incorporation. LLCs will pay their first tax on June 1st of the year following their formation. Delaware has no residency requirements. Owners and directors of Delaware do not need to be residents or have physical address in Delaware. You will need a registered address, a service which Inc. Plan (USA) can provide for you at a modest price, as it does for thousands of corporations. Delaware C-corps and LLCs must have one or more members. State law does not require officers, directors, shareholders or members to be listed in the formation documents. Directors of C corporations must be at least 18 years of age. Delaware LLC names must end with the term “Limited Liability Company” or the abbreviations “LLC”, or “L.L.C.”. The use of the words “Bank”, “Banc”, “Banque” or “Trust” need approval from the state’s Department of Banking. LLCs in Delaware are required to file a formation document called the Certificate of Formation. Additionally, the state requires the filing of an Annual Franchise Tax Statement, which is due on June 1st of the year following the formation. The Certificate of Formation must include the name and address of a registered agent which resides in Delaware, and which is available to manage legal and tax business documentation. For more help with the incorporation filing or for registered agent services feel free to contact Inc. Plan (USA). In Delaware, LLCs are treated as partnerships for state tax purposes. Therefore, LLCs are not submitted to a corporate income tax, but on its members’ distributive share of LLC income. Each of the 50 American states has its requirements for incorporating. The essential requirements for C- corporations established in Delaware are as follow. Companies incorporated in Delaware must own unique names and are allowed to use endings like “Company”, “Corporation”, “Incorporated”, “Limited”, “Association”, “Cub”, “Foundation”, “Institute”, or “Syndicate” along with their abbreviations. However, if the name contains the terms “Bank”, “Banc”, “Banque” or “Trust” the company needs an approval from the state’ authorities. Firms incorporated in Delaware, are required to file a formation document called the Certificate of Incorporation. Additionally, incorporations must submit an Annual Franchise Tax Report. Both the initial filing fee and subsequent franchise tax are based on the authorized shares. Increasing the capital structure may increase filing and tax fees. The Certificate of Incorporation must include a listing of the company’s authorized shares and per value, as well as the name and address of a registered agent with a physical Delaware address. Inc. Plan (USA) can help you with the necessary filings and also with qualified registered agent service. There is no income tax on corporate income earned outside of Delaware. Both corporations and LLCs pay a modest franchise tax.